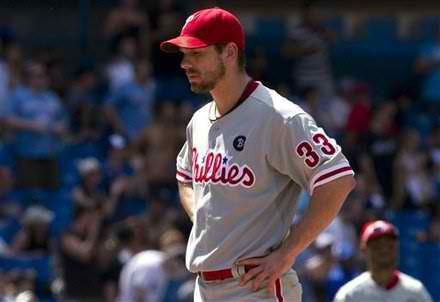 When the Toronto Blue Jays rallied from a 4-0 deficit to defeat Cliff Lee and the Philadelphia Phillies, it not only snapped Lee’s streak of 34 consecutive scoreless innings, but also marked the first time that Lee had lost a game in which he had a lead of four or more runs. According to Elias Sports Bureau, prior to Sunday’s loss at Rogers Centre, Lee was 69-0 in 77 career starts when spotted four or more. Lee, who had not allowed a home run in 49 innings, gave up three in the Jays four-run eighth inning. If a streak is going to end, it might as well end hard! Still, Lee managed nine strikeouts over 7 and 1/3 innings. Here’s a video, highlighting all nine Ks. This entry was posted in Philadelphia Phillies, Pitching, Starting Pitchers, Statistics, Toronto Blue Jays and tagged Baseball, Cliff Lee, Elias Sports Bureau, Major League Baseball, MLB, Philadelphia Phillies, Pitchers, Rogers Centre, Starting Pitchers, Statistics, Toronto Blue Jays. Bookmark the permalink.